With a stay at Holiday Inn Express N.Myrtle Beach- Little River in Little River, you'll be within a 10-minute drive of Cherry Grove Pier and Valley at Eastport Golf Club. This hotel is 9 mi (14.5 km) from Barefoot Landing and 8.7 mi (14 km) from Alabama Theatre. Make yourself at home in one of the 79 air-conditioned rooms featuring refrigerators and microwaves. Flat-screen televisions with cable programming provide entertainment, while complimentary wireless Internet access keeps you connected. Bathrooms have showers and hair dryers. Conveniences include phones, as well as coffee/tea makers and irons/ironing boards. Be sure to enjoy recreational amenities, including an outdoor pool, a spa tub, and a fitness center. This hotel also features complimentary wireless Internet access, gift shops/newsstands, and a television in a common area. Featured amenities include a 24-hour business center, express check-in, and express check-out. Planning an event in Little River? This hotel has facilities measuring 450 square feet (42 square meters), including a meeting room. Free self parking is available onsite. 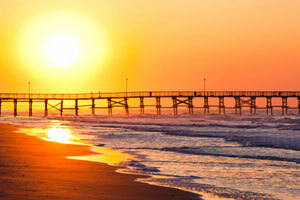 The preferred airport for Holiday Inn Express N.Myrtle Beach- Little River is Myrtle Beach, SC (MYR).